Carfax Certified. 59K Miles!!! Perfect Student Vehicle! Needs Nothing! Immaculate! 2012 Nissan Xterra * SE * 59K miles * CARFAX CERTIFIED * VERY Sporty 4.0 Liter 6 cylinder engine * Automatic Transmission * Power Windows * Power Locks * Cruise Control * Tilt Steering Wheel * Aftermarket JVC Radio with Bluetooth Hands free/WMA/MP3/CD with remote * Roof Rack * Keyless Entry with both keys and remotes * Tinted Windows * Running Boards * All mats and Manuals This Xterra is in amazing condition and super sharp!! Not sure there is a cleaner one out there. This SUV NEEDS NOTHING. This Vehicle comes with a clean TEXAS title and IS NOT SALVAGED!!! The vehicle has the ORIGINAL VIN Stickers on EVERY body panel! This SUV was just professionally mechanically serviced and a 125 point Certified Pre-Owned inspection was just completed on this vehicle and it needs nothing. Both Vehicle History reports along with the 125+ point inspection are available for your review when you test drive the car. This would make a great first car. The Steel Blue exterior is in remarkable condition, there are no dents, scrapes or scratches on the paint. NOT EVEN A DOOR DING!!! This SUV has been GARAGE KEPT! The Gray Cloth interior is also in excellent condition. There are no stains, wear marks or burn holes on the seats or carpeting. NEVER SMOKED IN. Guaranteed no disappointments! Must see the ORIGINAL stunning condition of this SUV to believe! This SUV is truly in IMMACULATE condition in and out. All vehicles are shown "BY APPOINTMENT" please call 817-688-9020 to set a convenient time that works for you. Our normal appointment hours are Monday-Friday 9AM-6PM, Saturday 10AM-5PM and Sunday we are normally closed. We do have a pretty flexible schedule, and are more than happy to work with you before or after normal appointment hours (even on Sunday's), please call us and let us know what works for you. FINANCING IS AVAILABLE through a wide variety of outside lending sources including banks and credit unions depending on your credit history and down payment. We accept trade ins and we will buy your car even if you choose not to buy ours. If you would like to learn more about financing, trade ins, shipping and our service department please click on the "ABOUT US" tab at the top of this page. 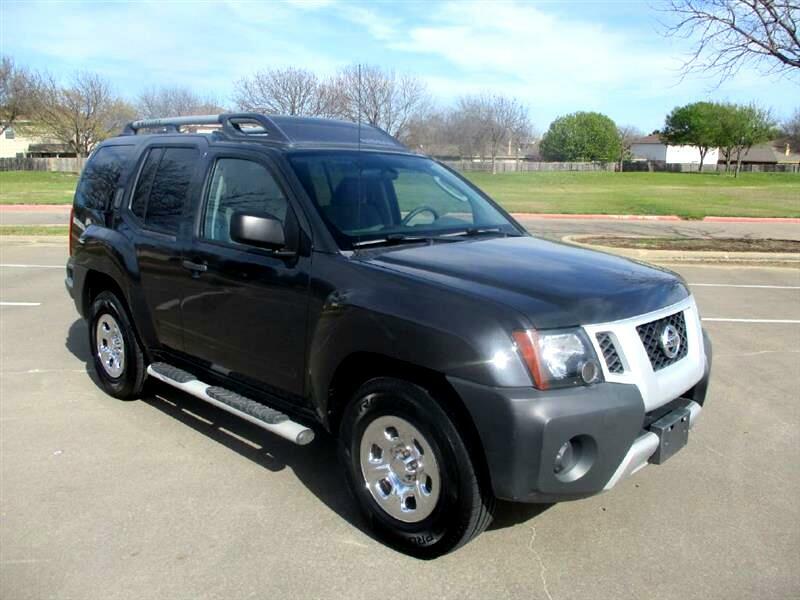 Message: Thought you might be interested in this 2012 Nissan Xterra.